While a kayak trip may not be the first thing that comes to mind when planning your trip to the Alabama Gulf Coast, it can become one of the most memorable. When you explore by kayak, you experience nature at its most pristine and undisturbed. With no engines, or props, to propel you, you slow down and take a step back in time. You become more connected with nature. The birds, fish, and other wildlife seem to relax a bit…allow you to get a little closer. Your mind relaxes too. The stress of your every day life can be instantly melted with the sight of a beautiful sunset, the intoxicating scent of fresh air, spending real quality time with your family, or the sounds of un-touched nature. To book, start by selecting how many kayak(s) you need. Then select the date you would like the kayak delivered to you and hit “Book Now”. 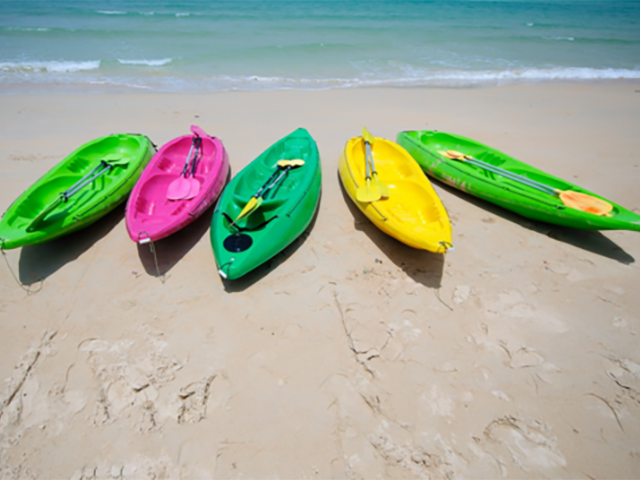 Each rental is for one week and includes a kayak, life jacket and paddle.